Automation, DevOps, Infrastructure as Code, whatever you want to call it, I have been interested it it for quite a long time and have been wanting to learn it. I happened to go to Camp Mustache this year, where I met someone who currently works with Chef as part of his main profession. He recommended I maybe check out Chef Conf and a month later I decided to pay my way on my own dime. When deciding to go to the conference, Monday is an optional day where you can choose from several workshops or a community Summit. Never having done a community summit, I figured id go and see what such an item is like. The way it works, at least for this conference, is everybody here has the ability to propose a topic to be discussed, written on a post card, then put on a big board to vote with. After everyone has pitched their ideas, everyone gets to vote. Since there going to be 4 sessions going on at a time, everyone gets 4 votes. After the winners are decided, the group sets up the schedule for topics, each going for an hour. From this point, you’re free to go from session to session to participate listen and learn however you wish. There’s no judgment in moving from one to the other, you’re free to go as you see fit. The topics were a vast array of different interesting items, from using Terraform to automate system deployment, to people using chat bots in their organizations for productivity, to discussing the issue of Burn-Out in the industry. I enjoyed it so much I hope to set up one of my own at some point in the Richmond area. I just need to do the research. The next morning, the conference begins officially, with a much larger attendance ready for the keynote and upcoming sessions. 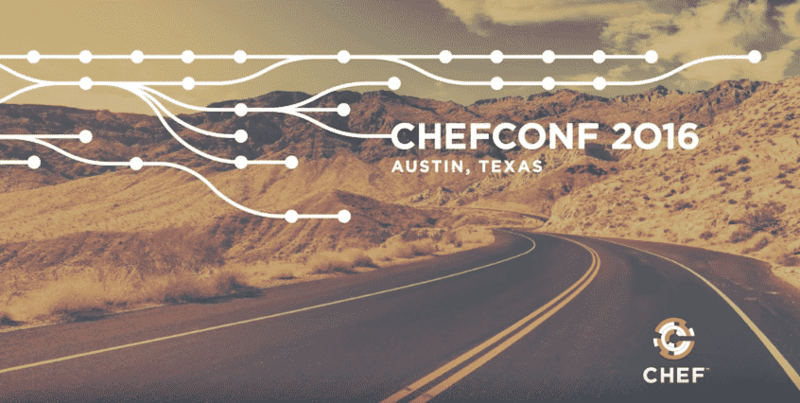 At the Keynote on Tuesday, Chef announced the release of Chef Automate, a new enterprise product to allow easier use of the entire suite of tools Chef has developed, such as InSpec, and Chef Delivery and Habitat. My favorite talk by far was the next one, where the CEO of Alaska Airlines discussed how they need to as the little guys work much faster and agile to compete with the big fish such as Delta, AA and United. If you have 20 minutes to spare, please watch the video below, it’s absolutely worth your time. After the keynotes and lunch, the sessions start for the conference. There are 7 sessions going on every hour and you can only pick one. Luckily all of them are being recorded so you can watch the others you are interested in when they go online. I went to several sessions this day on getting started with chef in an environment where nobody uses this tech (The NFL!). , as well as how to start using Chef with Windows. This was very informative for me as up to this point my only use of Chef was with Linux and I currently work in a Windows shop for the most part. There was one more talk after discussing Desired State Configuration, DSC for short and writing classes to be utilized with chef with it. This talk went a little too over my head, but I am looking forward to going back to this one as I broaden my skill set. As many of these conferences go, there is a large expo hall where vendors are there to show off all their fun wares, as well as some employers to show what they are doing with this tech. One of the most interesting ones I ran into was Target, I had no idea their IT infrastructure was so big, they are fully using infrastructure as code and automation in their workforce and created the “IT Dojo” where they will have teams come in and learn this tech, so they can take what they learn to make themselves and the company more valuable. I think this is something that every company should be looking into doing at some point. For my homelab, I was very interested in Data Dog, a cloud monitoring services company which I heard about during the community summit and is a big player in this space. I am looking forward to playing around with their tech. One of the things i found great about this conference is everyone was very open to conversation, I found discussing going my own way here was a great starting point to meeting people and they were very receptive to it. By the end of the conference I had several business cards and linked in contacts with people who are happy to have me reach out to them if I have any questions in my journey though this tech! Even some chef employees themselves! Wednesday evening, we had a end of conference party with 2 local austin bands playing, Otis the Destroyer and Purple. I missed Otis, but man was I glad I was around to see Purple, they put on one hell of a show and it was a great end to a wonderful 3 days of learning in Austin. I had an incredible time at Chef Conf and I am grateful to the man who recommended I come, life can be funny sometimes, If I never went to camp mustache, I may have never met him and not known about this conference to go to. The entire Chef community is very open an engaging, everyone is open to conversation and helping others. Many times throughout the conference I found people asking others about issues they were having, and another group ran into that same issue and was able to tell them what they did to resolve it. This is the kind of thing that makes conferences so valuable even if it may not show directly to an employer such as regular training. Everyone here is a peer, this conference is for all the tech people out in the trenches doing the work day in and day out. Where else are you going to be able to ask people from so many difference spheres of industry how they solve these problems? You can’t exactly call your competitor and ask to speak to their tech team about how they did X, but here everyone is open, sharing and growing together. I hope to return next year if I can and go to more conferences, last one was 6 years ago and I haven’t been this energized in tech in some time!